I made him a pie for his birthday. Because he prefers pie to cake. And can you blame him? He who was born at the tail end of September in the Northern Hemisphere and all around are perfect apples begging to become pie. 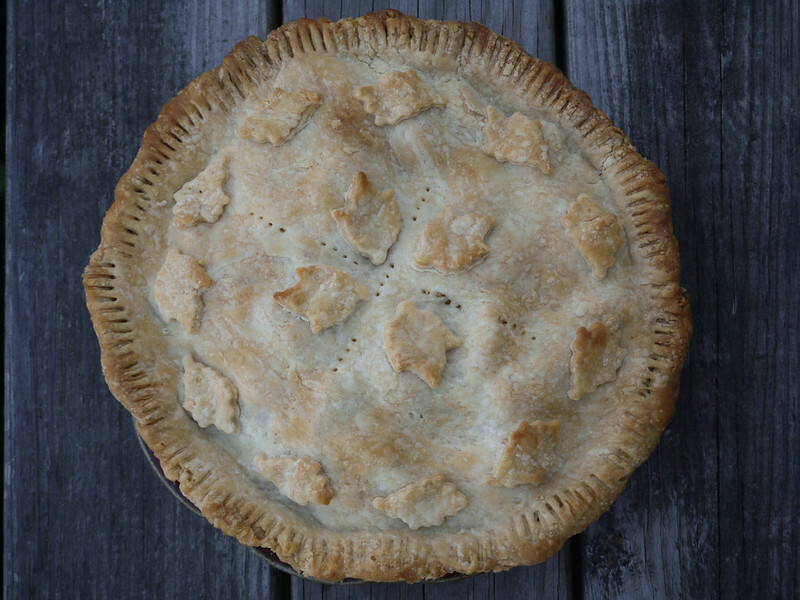 The best apples for pie, in our opinion, are Golden Russets, but those weren’t to be had this year for lowly pie (being coveted for hard cider), and our old Golden Russet tree bit the dust, and our new Golden Russet tree is not yet bearing. But I found a substitute in a mixture of Pomme Gris, 20-ounce Pippins, and Ginger Golds that I hope will do. Tonight, we went out to feed the goats in the Autumn dark. It took awhile for our eyes to adjust, but we know the way after all these years. The goats were waiting, impatient but quiet. The stars popped out, and there was the comforting Milky Way, encircling us, as we orbit. Another year. Another happy birthday, my dear. Beautiful photo, beautiful pie, beautiful sentiments. This looks scrumptious! Thank you for sharing.